Welcome back! This is week 2 of our Sew Along, and I hope you are excited and ready to get started. By now you have bought a pattern, read the back of the envelope and all of the instruction sheets. Hopefully you have found some fabric that you love and gathered all of the necessary notions and tools. Before you do another thing, if you have not pre-washed or cleaned your fabric, please do so now. This is another Good Habit. Imagine the horror of spending a lot of time and effort making a lovely garment, only to have it shrink 2 sizes the first time it is washed! Let me send you to one of my favorite resources for more information about preparing fabric: www.sewing.org . When you get there, select Guidelines for Sewing in the left hand column. Go to section 4 and refer to 4.104: Preparing to sew – Fabric and pattern preparation (PDF file will open). Then read section 4.204 to learn more about straightening the grain of the fabric. 2. Once you have decided which view you like best, the pattern guide sheet will tell you which pieces to use. Put those pieces to one side. Fold and store the extra pieces in case you decide to make a different view next time. Notice that there are two views to select from: View A and View B. Each piece is numbered for easy reference, and a line drawing of each piece is shown. Below that is a list of the pattern pieces. The first few pieces listed are used in both views. The pieces that are only used for View B are indicated. Remember that you can create your own view: perhaps you like View A but want a sleeve, or you may like View B but prefer not to have a collar. You may even want to use contrasting fabric on the lower skirt and sleeves, as well as the front facing and collar. The combinations are numerous. You may need to purchase a little extra fabric in some cases. 3. Press each of the pattern pieces that you plan to use. Use a warm, dry iron. This assures you of more accurate measurements. At this point, many people who do a lot of sewing prefer to make a copy of the pattern before they make any. 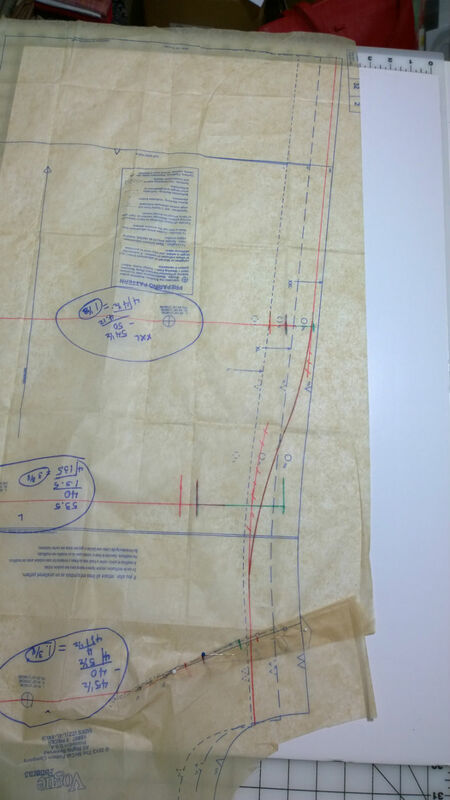 If you plan to do that, use tissue paper, drafting paper, or Pellon like material made for making patterns. The tissue paper that doctor’s offices use is a great product if you can find it. 4. If you are taller or shorter than normal, you may want to adjust the length of the pattern. There are lines drawn on the pattern to make this easy for you. Frequently there are more than one set of lines to alter the length. Our pattern has 2 sets: one near the waist and one at the hemline. If you are long or short waisted, you will find this very helpful. 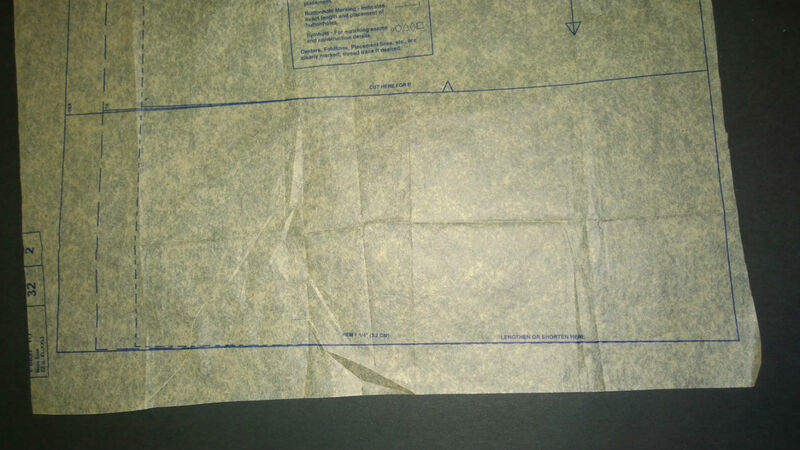 Please note that the pattern indicates that it has allowed for a 1 1⁄4” hem. 5. Review your body measurements that you used to purchase the correct size pattern. Remember that each of the measurements that go around the body (bust, waist, hips) will be divided by 4 to evaluate the fit of the pattern. 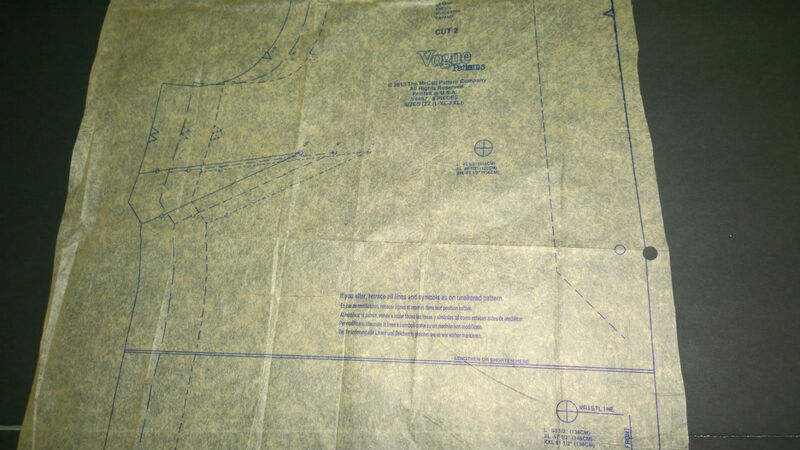 You will be cutting 2 fronts and 2 backs to make the whole garment. 6. Measure each piece carefully to be sure that the bust, waist, and hips will fit properly. Another area that sometimes needs attention is the shoulder length. Think about how it feels to try on clothes in the store…what are the problems you encounter? You may experience similar problems with a pattern that has not been altered. These also indicate where the bust, waist, and hipline are. 8. You will notice that the pattern is designed for use of multiple sizes. A good resource for understanding how to deal with that is at www.sewing.org in section 13. This topic explains how to use multi-size patterns effectively. 9. 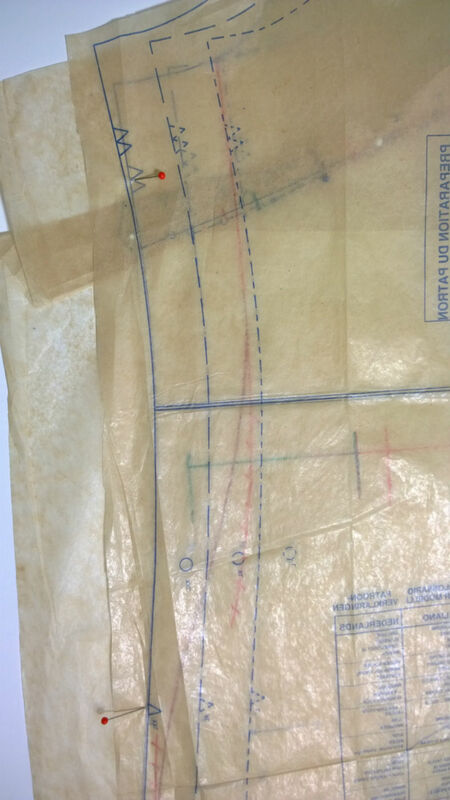 To determine where you need to cut the pattern, use a red fine Sharpie and mark 1⁄4 of your bust, waist, and hip measurements from Center Front and Center Back on each pattern piece. You may need to use one size for the hip area and a completely different size for the bust area. 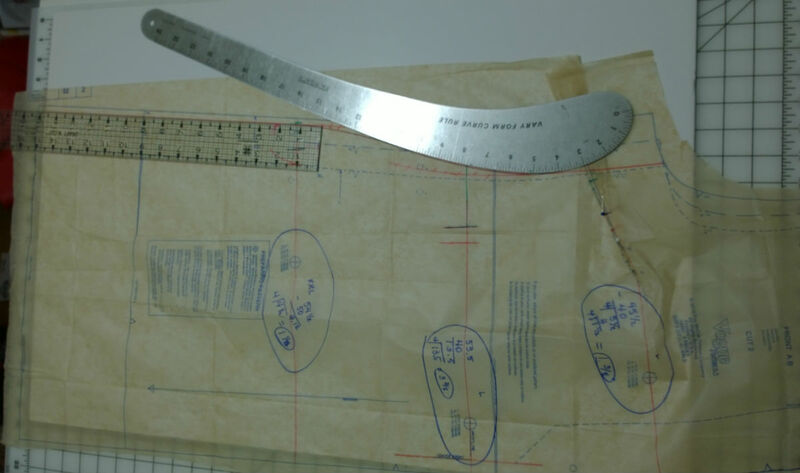 To get a good idea of how much ease is intended, subtract the pattern size measurement from the finished garment measurement found on the pattern. For instance the Large bust size is 40” and the finished bust measurement is 45”. 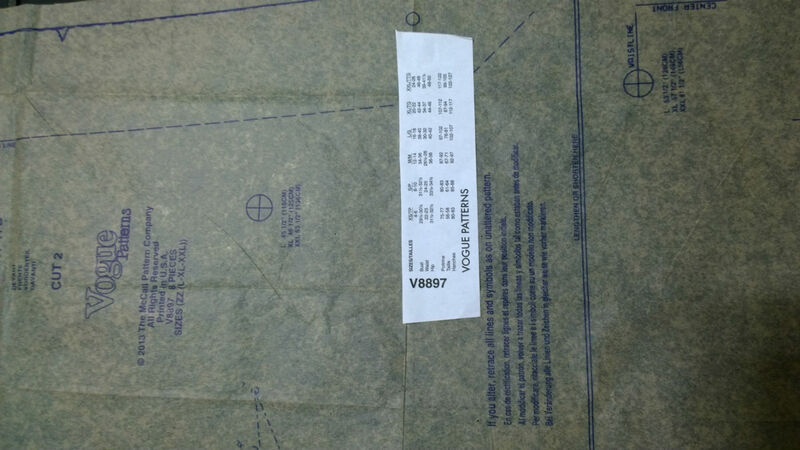 After adding the 5/8” seam allowance, add 1⁄4 of the difference between the measurements. In this case, the amount is 1 3/8”. The following photo will show you what I mean. The red line closest to CF indicates my measurement. The next line is the 5/8” seam allowance. The line extended in green is the intended amount of ease. 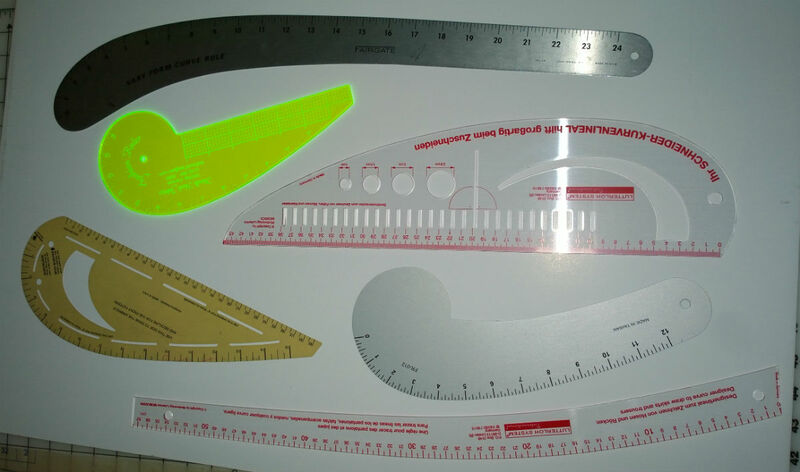 You will likely need to reposition the curved ruler 2 or 3 times in order to get a smooth line for cutting. You can see in the photo that I had to reposition 3 different times. The next photo shows the finished line. Leave the pins in the dart for now. Go ahead and do the same thing to the dress back pattern piece. Before you “true” the back side seam, lay it on top of the front in order to compare. In order for the dress to hang properly, these seamlines will need to be very similar. 11. In comparing the back side seam to the front side seam, you will notice that there is some “ease” between the double notch near the bustline and the single notch near the hip line. This is not a mistake. When we begin to sew, I will show you how to deal with the ease. Just realize that the back side seam is longer than the front side seam. 12. Once you have your pattern work completed, I recommend that you find some inexpensive cotton fabric, such as muslin, and cut out the fronts and backs of the dress. 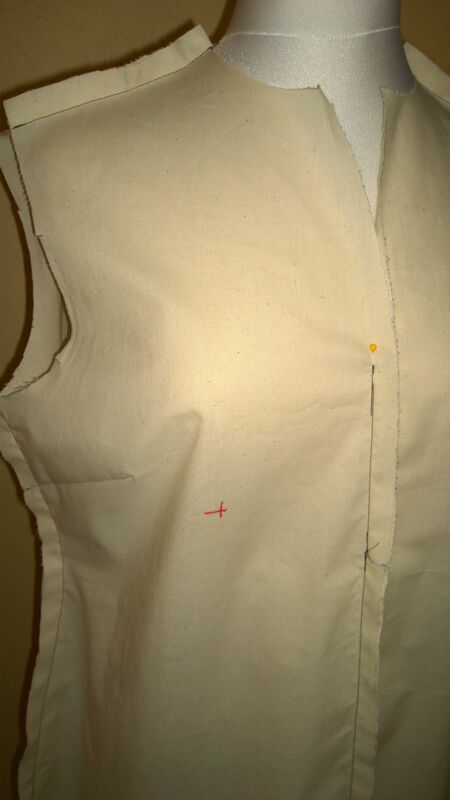 Sew the seams with the WRONG sides of the fabric together so that the seam allowance is on the outside of the garment. This makes it easy to mark any alterations that may be needed. 13. If you need to make alterations after trying on the test garment, follow the pins or markings on the garment to do so. One alteration that many of you might want to make is to raise the neckline opening. It is designed to be low in order to wear a camisole or tank top underneath. If you don’t wish to do that, then mark a comfortable spot for your neckline. 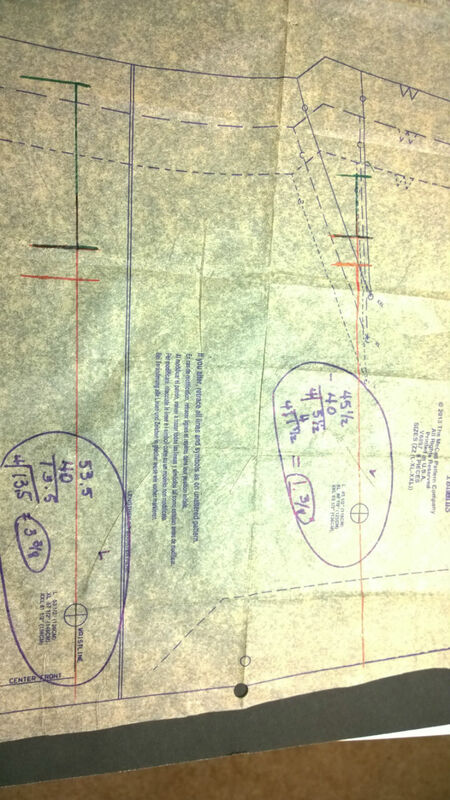 Either measure the distance or lay the test garment on the pattern to add the new mark. On the front facing pattern, make the same mark. You may even want to make the facing shorter if you raise the neck opening. 14. When I made my test garment, shown in the photo above, I pinned the point that is comfortable for my neck opening. I also noticed that my bust dart needed to be lowered. (The effect of gravity as we age!) If you find the need to move your dart, there are some great instructions in the book “Fit For Real People”. Refer to pages 144-145. Also, on page 9 is a great diagram example showing how the bra cup size affects the size of the bust dart. One point that I want to make very clearly about bust darts: they should end at least ½ inch from the apex of the bust, and not more than about ¾ inch. If the dart extends to the bust point, your garment will not hang properly. Cutting the garment will follow next week!